(NaturalNews) Sugar is an addiction similar to alcohol, tobacco, or drugs. It feels and tastes good while we are consuming it, but it can destroy your body and mind on the long-term. 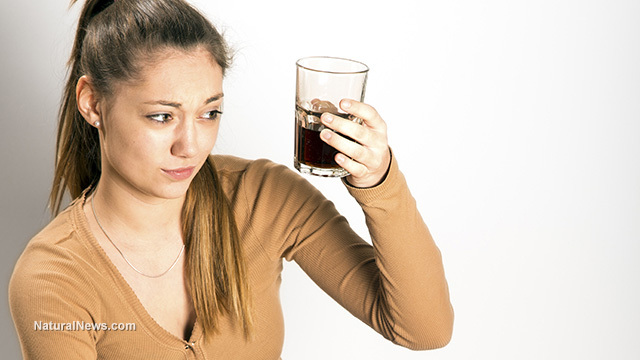 By now, we all know that soda is addictive and wreaking havoc on our system. Therefore we often opt for what we think is a healthier juice or iced tea. However, these so-called healthy options are often as bad, or even worse. According to the Center for Science in the Public Interest, sugary drinks make up almost half of all added sugar in the average American's diet. As more evidence emerges about the devastating effects of sugar on our health, it may be time for you to give it up, or at least drastically reduce the amount you consume. Your health will dramatically improve if you start replacing the 15 drinks below with water or other healthy alternatives such as unsweetened tea or fresh homemade fruit and veggie juices. Nothing is better than sipping a hot cup of cocoa with whipped cream on a rainy fall or chilly winter day. However, know that this warming cup of pure bliss packs 400 calories and 43 grams of sugar. While tea is definitely a health drink, the sweetened stuff you find in the grocery store can pack over 30 grams of sugar per bottle. Over the recent years, coconut water has become a popular health drink touted for its high levels of electrolytes and hydrating effect. However, make sure to read labels carefully as many of the flavored versions contain a lot of added sugar. Energy drinks are not healthy and can pack more than 25 grams of sugar in one cup. According to a study published in in the journal JAMA, energy drinks raise blood pressure and heart rate which could lead to increased cardiovascular risk. Adding probiotics to your diet is a good thing to do. However, many people opt for the sweetened yogurt drinks which don't have that strong tangy flavor. These small drinks can pack up to 26 grams of sugar. With more people living a plant-based lifestyle or struggling with lactose intolerance, the nut milk business is thriving. While some sources claim it to be better than cow's milk, some of these nut milks may not be a good alternative either. Many of today's brands contain questionable ingredients and heaps of sugar. Commercially available fruit juices – even when they state 100 percent fruit juice – are loaded with preservatives, colorants, and sugar. To give you an idea, one cup grape juice contains about 36 grams of sugar, which is not far off from the 44 grams of sugar in a can of lemon-lime soda. Even though smoothies are made of vegetables and fruits, they often contain large amounts of sugar. Despite the "no sugar added" sticker on the label, many people often forget that fruit and fruit juices are still quite sugary. While tonic water may give you a healthy impression. Unlike its name suggests it doesn't even come close to the benefits of drinking water. Twelve ounces of tonic water adds 32 grams or 8 teaspoons of sugar to your glass. Maybe the king of sugary drinks are those fancy coffee drinks we all like. A grande white chocolate mocha Frappuccino at Starbucks packs a whopping 67 grams of sugar. Sports drinks are nothing more than sugar and water. While athletes may benefit from these quick energy fixes, for most people water will do just fine as a hydrating sports drink. Don't let the added vitamins lure you into drinking these sugary waters. Some of these bottles can pack up to 7 teaspoons of sugar. Again, lemonade is nothing more than water, sugar and added flavor. This popular party drink is a dessert in a glass. According to Chicago-based nutritionist Renee Clerkin, a margarita made with a bottled mix contains as much sugar as two and a half to three pieces of cake. And if you thought you are better off drinking a beer, think again. They can pack up to 198 calories per eight ounces.